Our newly decorated 3 bedroom cottage is situated just outside Glenluce. Featuring a large kitchen/dining room with a traditional aga as well as a large living room (including log burner), The Cottage is the perfect base for exploring our local area with friends or family. 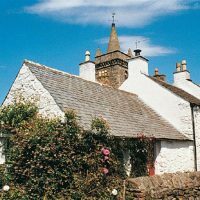 Situated on the sea in the small hamlet of Kirkandrews in south west Scotland the cottages are the ideal place to relax and unwind with views looking out over the Solway coast. With beaches on your doorstep as well as opportunities for hill walking, sea fishing, golfing, cycling and water-sports, there’s plenty to keep the whole family occupied. Or perhaps visiting historic castles, renowned gardens and ancient woodland will appeal to you? Kirkandrews Kirk, sitting opposite the cottage, is a unique little kirk (or church) completed in 1906, with parapet and castellated tower resembling a miniature castle. Set in a charming coastal location, the property is only a short drive from the harbour town of Kirkcudbright, known as ’Scotland’s Artists Town’ and was particularly popular with the Colourists, many of whom lived in the town in the early 1900s. It is a very active and friendly community; visitors to the town can enjoy the variety and number of activities and events held in the area all year round. Shops and restaurants 8 miles, pub 3 miles. 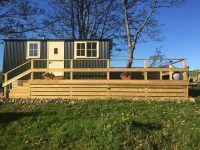 Carraig is a luxuriously appointed Shepherd’s Hut set in a small paddock beside our farmsteading. Egyptian cotton bedlinen, deep 2000 pocket-sprung mattress, pure wool throws and lots of comfy cushions ensure you have a good night’s sleep in the absolute peace and quiet of this unpolluted, hidden countryside gem. On the edge of Galloway Forest Park, no light pollution means on cloudless nights a myriad stars, planets, and even the Milky Way can be seen. The views from your bed day or night are breathtaking. A tiny log-burning stove heats the hut, and there’s a mini-oven with a grill and 2 hotplates for rustling up all your mealtime needs. Store your provisions in the under-counter larder fridge. Hot and cold running water, as well as logs, firelighters and kindling are provided. Free Wi-fi. A shower and loo supplied with toiletries and toilet rolls and fluffy White Company towels complete the facilities on offer inside the Hut. Externally, decking surrounds Carraig, with a charming bistro set for morning coffee or evening aperitifs. From here you have fantastic long-ranging views over farmland to the Galloway Hills in the distance. The paddock is for your exclusive use. There is free parking, an electric vehicle charge-point, and although we live on site, we will only come and see you to check you in and out and if you need us. Carraig sleeps 2 in one double bed. Because of farm animals in close proximity, sorry, no dogs or pets. No children. Prices from £100 per night. Min 2 nights. Maximum 2 persons. See website for further details and more photos. 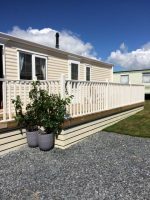 Self Catering Chalet Caravan in the village of Monreith. 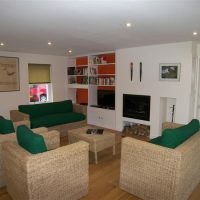 Dog Friendly and close to the beach and Wigtown Book town and Historic Whithorn. Quiet rural site ideal for R&R and attending local events and festivals and unwinding. Close to St Medans Golf Course. ” bedroom sleeps 4. Surrounded with views of the Galloway Hills our Caravan and Motorhome Certificated Location is situated a mile from Newton Stewart and a 15 minute drive from Wigtown. Our five serviced pitches are hardstanding with grass area. Each pitch has its own drinking water tap, grey water drain and access to an electric hook up. Chemical waste disposal also on site. On site there is the “Wee Hoose” which is home to a toilet and shower as well as an information point. Shingle Lodge has two luxurious super king-size or twin bedded rooms both ensuite with wonderful sea views looking over the Irish Sea to Northern Ireland. A fully equipped home away from home with all the amenities you may require during your short break. For more information see our FAQ’s page. 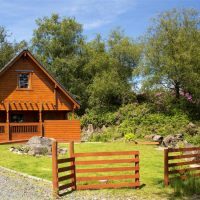 This self contained cottage is perfect as a base to explore surrounding Dumfries and Galloway, the Ayrshire coast or even a day trip to Northern Ireland. Come and stay in this beautiful Victorian Shooting Lodge, in the steps of John Buchan and The Thirty-Nine Steps. With 10 individual bedrooms, in its own private cove and 3 AA rosette restaurant, it is a real retreat. and the Wigtown Book Festival, there is plenty to keep you busy. First floor apartment in converted Victorian stables, three double/twin bedrooms all ensuite (sleeps six). Kitchen and open plan living dining room. TV and wireless wifi. Beautiful rural location within easy reach of A75 and about 40mins from Wigtown by car. It has a tennis court in the garden, barbeque terrace and is 15 mins by car from the beach. £40 per room per night or £100 to take the whole place per night. 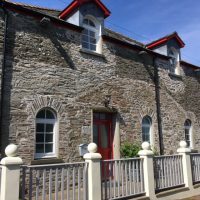 The Drill Hall in Whithorn is a former Cameronian church, Dad’s Army-type Drill Hall, and Council store room, lovingly turned into a beautiful home in the mid-2000s. We love to greet visitors and provide a sumptuous breakfast! This unique cottage is an ‘A’ listed building and is typical of the old part of the town. Nestling down one of the town’s ‘closes’ the house has been tastefully upgraded and provides spacious accommodation with lots of character. Kirkcudbright is famed for its unique light which prompted an artists’ colony of some renown which has led to Kirkcudbright’s designation as the Artists’ Town. There are a variety of local independent shops, two supermarkets, several galleries, a selection of hotels, pubs and restaurants in the town. Kirkcudbright also has a working fishing harbour, an 18 hole golf course, indoor heated swimming pool & gym. 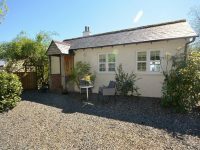 A cosy studio-style cottage on the outskirts of picturesque Kirkcowan. It offers a beautiful rural retreat with woodland and countryside views. Nestled in a peaceful, tranquil location, this rural retreat is perfect for couples. It’s within walking distance of all local amenities, including Kirkcowan’s friendly country pub. Also within easy reach are the historic marketing towns of Newton Stewart, Gate House of Fleet, and Kirkcudbright which is otherwise known as the Artist town. The area is a haven for outdoor lovers, with numerous glens, country trails, nature reserves and coastal paths offering great walking, hiking, cycling and mountain biking opportunities. Explore Wigtown Bay, Luce Bay, Solway Firth coast line, and Galloway National Park, or enjoy the water sports and Europe’s longest zip wipe at Loch Ken. This single-storey, studio-style cottage offers an open-plan lounge/kitchen/sleeping area – the perfect cosy retreat to explore the area. Relax on the sofa in front of the TV or with the latest bestseller, or cook up a quick lunch or light bite in the kitchen area, which has an electric hob, microwave and fridge/freezer. The cosy double bed has views across the garden and woodland, or you can turn the TV to watch a film in bed. There’s also a shower room with WC. Stepping outside, you’ll find a picturesque enclosed garden to the front of the cottage, which is set amid 10 acres of land – perfect for exploring. Here you’ll find a seating area where you can sit back and relax in the fresh country air, whilst enjoying a drink. There’s off-road parking available for two cars. 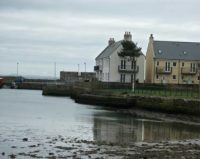 Set in a harbourside location in a picturesque 18th-century village, this traditionally-styled, end-of-row townhouse offers stunning uninterrupted views over Garlieston Bay and easy access to the beach and coastal paths. Part of a sympathetic redevelopment of an early 19th-century mill complex (with some Grade B listed buildings), it is an ideal holiday base from which to explore the quiet Machars Peninsula with rugged coastline, sandy beaches and wealth of historic interest. Galloway Forest Park, Seven Stanes close by. Sea, river and loch fishing available; sailing, water sports, golf accessible. Wigtown (National Booktown) and Whithorn’s historic dig and priory nearby. Shop, pub and restaurant 200 yards. Open-plan kitchen/living room with dining area, sea views. Separate toilet. First floor: Double bedroom with French doors to balcony, panoramic harbour views to hills beyond and en-suite shower room with toilet. Twin bedroom with sea views. Bathroom with shower attachment and toilet. Two Dogs Lodge is a traditionally built wooden lodge within a small quiet development about 5 miles from Glenluce. There is an attractive decking area outside together with a garden all with views to surrounding Countryside. The woodland setting is a haven for wildlife. The beaches at Luce Bay are close to hand with opportunities for beach and cliff walks. The location of Two Dogs Lodge provides an ideal base for exploring the local area including Logan Botanic Gardens. The Galloway Forest Park provides superb opportunities for bird watching or if you wish you might try at night, star gazing as the park has been designated a Dark Skies Park due to the quality of Darkness! Mounting biking is available in the Forest Park at Kirroughtree where there is a stage of the Forestry Commission 7 Stanes Trail. There are numerous opportunities in the locality for hill walking and other outdoor activities including fishing and horse riding. Golf is readily available throughout the area with courses to suit all abilities. The Smiddy is a comfortable detached cottage in the tranquil hamlet of Glasserton. This is in the beautiful area of Galloway called the Machars, the area is rich in wildlife and history. The cottage has gated access and parking for several cars is available, this is off road. Ideally located for walking, golf, fishing, exploring coastal villages, local galleries, restaurants and cycling, close by are the 7 Stanes off road bike trails. The area in which the Smiddy is located has been designated a Dark Skies Park due to the lack of light pollution and the quality of the night skies is amazing, ideal for stargazing. This cottage is a former blacksmiths and has a “get away from it all” feel, the ideal place to recharge your batteries, whilst only being a short drive from local shops and archaeological sites at Whithorn, the Isle of Whithorn with its accessible harbour and excellent pub, The Steampacket (CAMRA Award winner) and numerous peaceful beaches especially at Monreith. The Smiddy has a large open living area with kitchen, lounge with a log burner and dining area, the French doors open onto the patio/barbeque seating area and spacious garden, the garden is secure and fenced in, there stunning views over the surrounding countryside. Bed linen and towels are provided for your use during your stay, there is storage for bikes with an anchor point for locks. One well behaved dog is welcome and a dog run is available in the garden for your use (bring your own bedding and bowls). There will be a welcome bottle of wine for your arrival, we also supply some complimentary tea, coffee and milk. The Orangerie is set in Bargrennan. Guests staying at this holiday home have access to free WiFi. The property has been a labour of love by the owners to convert and renovate it to the highest of standards providing excellent self-catering accommodation for six people. Digby Street is a quiet side road off the main street in the charming and popular bustling town of Gatehouse of Fleet. The accommodation provides a large spacious open plan kitchen/dining/sitting room furnished and finished to an excellent standard. There is a seating area on the first floor landing which leads to master bedroom with ensuite shower room, and further double bedroom and bunk bedroom together with spacious family bathroom with Jack and Jill wash basins. The accommodation has been carefully modernised throughout to compliment the character of the property and you will find many pictures, books and objects from different parts of the world. In the local area you will find many exhibitions, festivals and performances throughout the year. Gatehouse of Fleet has excellent facilities including a good range of pubs and hotels, mini markets and Heritage Sites such as the Mill on the Fleet and Cardoness Castle. There is direct access to attractive river and woodland walks from the town whilst those looking for more strenuous activities have easy access to hill walking and mountain biking in the Galloway Forest Park on the Forestry Commission 7Stanes Biking Routes. The local area also has many exhibitions, festivals and performances throughout the year. Gatehouse of Fleet is ideally situated for exploring South West Scotland and had easy access to Solway Coast with its sandy beaches and cliff walks. Throughout the area there are numerous golf courses, opportunities for fishing and other water sports. The properties at Mochrum Park are in an ideal position for walks through the park and along side the river Bladnoch where we have some of our Salmon fishing the location also makes an ideal base for exploring the region and all that it has to offer. The properties are comfortable for the whole family to enjoy a relaxing holiday whether it is a Spring break, summer holiday or a festive getaway that you are looking for. We have owned the houses since 1986 and have built up a strong cliental that have been enjoying holidays at Mochrum Park for many years. The houses have just recently been upgraded and we are confident that your holiday with us in Galloway will be leave you feeling relaxed and with some fantastic memories. Newton Stewart is about 6 miles away, which has a variety of shops such as Sainsbury’s, local bakery and local award winning butchers. Wigtown ‘Scotland’s National Booktown’ is about 5 miles away which boasts some unusual craft shops and bookshops. The properties are ideally located in an idyllic countryside location where there are plenty of lovely country walks and an abundance of village tearooms, craft shops a short drive away. Overlooking Loch Trool in the heart of the beautiful Galloway Forest Dark Skies Park, The Buchan provides modern, comfortable accommodation for up to 8 people who enjoy getting away from it all and forgetting about the outside world. Set in a remote, stunning location and surrounded by hills and forests there are outstanding opportunities for walking and relaxation. Bird watching is exceptional and there are cycle tracks nearby. Fishing can be arranged through the Glentrool Visitor Centre, five miles away. Converted from a farm to a hunting lodge in 1855 by the Earl of Galloway, this historic house offers life at a different pace. Its systems are entirely reliant on nature with its own hydro-electricity and separate water supply. It has full central heating and wood-burning stove. A large conservatory (with hot tub) allows you to relax and enjoy the spectacular views and wildlife whatever the weather. There is no television reception, but a small set is provided for those who wish to bring their own video or games. There is a payphone for those who fret at the loss of a mobile signal! The house is surrounded by over two acres of private land with a small burn, woodland and pond. Beyond this is some of the finest oak forest in Scotland with trees up to 400 years old. Sheep graze nearby and wildlife predominates so dogs must be kept under strict control. The house and its surroundings can be enjoyed all year round but insect repellent is strongly advised in the summer! The Bothy, has been formed from part of the original farm steading situated within our working family farmyard. This property has recently undergone a complete renovation and has been finished to a very high standard to provide luxury accommodaion. With open views to the sea, it is an ideal couples getaway! We would love to welcome you to The Steading Cottage at Kirkmabreck which has been worked by our family for four generations, almost 100yrs. This recently renovated farm cottage sits in the heart of a busy working, upland farm which breeds native Black face Sheep and Galloway cattle, it is known as The Home of The White Galloway. 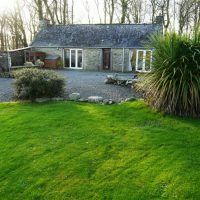 The Farm sits on a hillside overlooking the beautiful Wigtown Bay with panoramic views over the “Machars” and out to the Irish Sea and the Isle of Man. It is three miles outside Creetown and ideally placed for anyone wishing to explore this unspoilt coastline and hills. This area has so much to offer visitors from the thrill seekers racing round the mountain bike tracks at Kirroughtree to those just wanting to sit back and enjoy the peace and quiet, admiring the daytime views and the night time dark skies, free from light pollution. We are also trying to do our bit for the environment and have our own wind turbine on the hillside generating electricity. 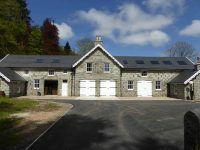 Spoutwells Farm Self Catering Holiday Cottages are an ideal base from which to explore south west Scotland. They are situated one mile from Stranraer, which is situated beside Lochryan, and the villages of Portpatrick and Sandhead are all nearby. The ferry terminal at Cairnryan, from where the fast P & O // Stena ferries sail to Northern Ireland, is five miles north of Stranraer. Day trip to Befast and visit the Titanic Museum. 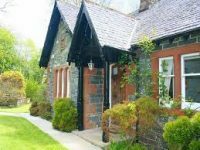 Spoutwells Farm Self Catering Holiday Cottages are ideal if your interests are outdoor pursuits and activities or you simply wish time to relax. They offer the perfect base to explore Dumfries and Galloway. The cottages are set on a small farm which has a pedigree flock of Suffolk Sheep. Seasonal vegetables are also available from the owners’ garden. 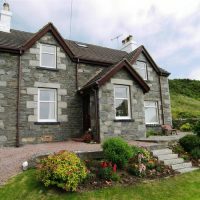 The Cottages are also convenient for access to the Rhins and the Mull of Galloway – with fine gardens, sea and loch fishing, five golf courses, and within easy reach of the fine beaches at Sandhead, New England Bay and Ardwell Bay. The area has a good number of restaurants and pubs serving meals, and most use local produce in their menus. Spoutwells Farm Self Catering Holiday Cottages is set in open countryside on the outskirts of Stranraer and conveniently situated for the Southern Upland Way, so is perfect for those who enjoy walking. There are excellent cycling routes in the area. Stranraer itself has a very good leisure centre with cinema/concert hall, fitness suites, sauna, gym and swimming pool. Situated on the National Cycle Route, near the village of Creetown and market town of Newton Stewart, these comfortable cottages offer panoramic views over Wigtown Bay and the Galloway Hills. Built in a traditional Galloway style, Cnoc Glass and Cnoc Doon are identical semi-detached cottages set within their own private, enclosed gardens on this family-run working farm. The porches to the front of the cottages maximise the panoramic views over Wigtown Bay and the Galloway Hills allowing you to sit, relax and enjoy the view while the gardens also have outdoor seating and barbecues, perfect for a family get together. Southfield House is a spacious Georgian townhouse in the centre of historic Wigtown,Scotland’s Book Town, in Dumfries and Galloway. Plenty of room for families and friends, this will become your home from home. Sleeps 7. Close to beaches, hills, parks and coastal walks. Great for cycling, walking, star gazing and relaxing. Self-catering that feels like home is how we like to think about Southfield. This spacious, three-bedroom Georgian townhouse is in the heart of Wigtown, Scotland’s Book Town. Nearby there are sheltered sandy beaches, great days out for the kids, cycling, beautiful gardens and nurseries, excellent fishing, golfing and in the Galloway Forest Park, the UK’s first Dark Sky Park. This is a fantastic house for families especially those travelling with an older generation. Downstairs there is a double en suite bedroom, newly refurbished large kitchen plus a comfortable sitting room with large screen tv. Upstairs a large double bedroom, a room with three singles for children and friends and a family bathroom, plus a second spacious and comfortable sitting room with large screen tv. Wigtown’s location gives you easy access to the Galloway Hills, a variety of beaches, fantastic gardens, golf courses, mountain biking – one of the Seven Stanes courses is located nearby at Kirroughtree outside Newton Stewart. There are walks from the front door including one to the nearby bird hide overlooking the Wigtown Bay Nature Reserve and bookshops galore. Across the street is The Bookshop, recently the focus of Shaun Bythell’s critically acclaimed The Diary of a Bookseller. Famous for immortalising rude customers on his Facebook page, Shaun is really a nice guy – just don’t ask for a discount! Relax in our large walled garden with different areas for the whole family. Read quietly in the sheltered courtyard as the swallows dart overhead; picnic at our purpose built table and benches; let the children escape safely to set up camp in the treehouse towards the end of the garden. With views over the picturesque harbour of Portpatrick and to the Irish Sea beyond Seaward is a stunning modern semi-detached holiday home located in the popular holiday village of Portpatrick. The local area is superb for quiet sandy beaches and coves well worth exploring. The area has many golf courses including just to the rear of the house the famous Dunskey Golf Course with Turnberry only about forty five minutes away to the north. South West Scotland has easy access to many outdoor pursuits including water sports at both Portpatrick and on Loch Ryan at Stranraer, mountain biking in the Galloway Forest Park part of the Forestry Commission 7Stanes Trails and of course walking, horse riding and wildlife watching activities. A special feature of the Portpatrick area is the mild temperate climate which allows palms and other exotic plants to thrive. Logan Botanical Gardens which is managed by the Royal Botanic Gardens of Edinburgh and also Glenwhan Gardens at Dunraggit are well worth exploring as is the maze at Dunskey Estate Tea Rooms on the edge of Portpatrick. The local Bladnoch Distillery at Wigtown is well worth a visit and gives a chance to sample a dram. With a variety of beaches nearby, seal colonies close to hand and plentiful opportunities to watch sea otters and other wildlife this superb holiday home with its large enclosed garden and outlooks over Luce Bay is ideal for family holidays. There is a pebble beach across the road from the house, a small sandy beach is within easy walking distance as is a good pub. A further large sandy beach is available nearby at Monreith. The immediate area adjoining is remote and unspoilt but with plentiful opportunities for exploring and outdoor pursuits. 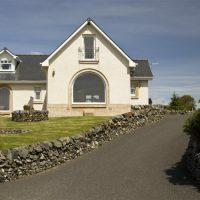 The property is practically on the South West Coastal 300 route too – a stunning drive just over 300 miles taking in our many miles of awesome coastline while you also have the opportunity to marvel at our hills, glens, forests and lochs. The town of Wigtown is within easy reach and hosts an annual Book Festival in September and other visitor attractions throughout the year. The town of Whithorn is also nearby and is the earliest known Christian Community. South West Scotland has a very mild climate due to the effect of the Gulf Stream which and there are several “exotic” gardens in the area which are open to the public and contain unexpected plant varieties for the area. Outdoor pursuits and activities include horse riding, golf, sailing and mountain biking which includes the 7Stanes Trails in the Galloway Forest Park (Britain’s first designated Dark Sky Park) and further afield at Dalbeatie, Mabie & Ae forests.